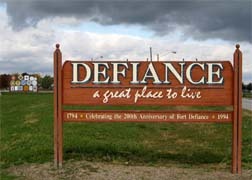 Defiance, Ohio –– Karri Krendl usually does not sleep with a gun at her side. She usually doesn’t sleep out in her Chevy Suburban either, listening for their mule to bray or her pony to act up. 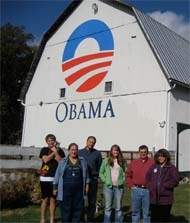 But ever since she painted her barn with an Obama “Hope” insignia, that has been their life. 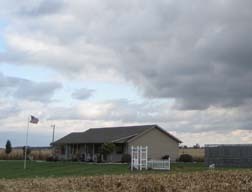 Karri lives with her husband Dan on a farm Krendl’s grandfather bought in 1920 outside Spencerville, a rural community of about 2,500 people in northwest Ohio. Karri, 51, is a family physician and Dan, 50 is a science teacher at Spencerville High School. Both are unabashed Democrats. Most of their neighbors are not. Last summer, when she heard the Obama campaign was looking for a few good barns to establish a beachhead in this largely Republican area, she was one of the first to sign up. The campaign sent an artist up from Cincinnati to map out the design. Dan rented a lift and, with the help of about a dozen friends and relatives, they began to paint. They painted almost 24 hours straight. After nightfall, Dan set up some lights and they kept painting. The next day, they held a picnic to celebrate. Democrats from miles around – about 60 in all – came to add the final touches. Karri could not have been prouder. “It’s really a symbol of unity, a way to let other people know there are Obama supporters around here and that we’re a positive presence in the community,” she said. Not everyone shared her excitement. The next Sunday, Karri and Dan went out for a bike ride. Turning around to admire their handiwork, they saw “NIGER LOVER” spray-painted across the barn. (“It turns out racists are not especially good spellers,” said Dan.) They quietly repaired the damage. A week later, they went to the Spencerville High School homecoming. When they returned, they found green paint splashed over the barn and “Nobama” scrawled across it. Whoever did it also left gaping tire tracks spun in donuts across their lawn. Again, they repainted. Two weeks ago, Karri and Dan got another scare. The sheriff pulled into the driveway to warn them that over in the next town vandals had just doused two Obama signs with gasoline that were hung on the barn of Gwen Picer. They were driven off before they could light it, but that’s when Dan pulled out the rifle. In Ohio, people take their politics serious. Driving into Defiance along route 15, I could see what he meant. Every other house had an Obama or McCain-Palin sign. It didn’t matter whether it was a farmhouse set out in the cornfields or white clapboard houses lined up one after another in the small towns, there was a sign in the yard for one politician or another, and often many. At Bud’s Restaurant the talk at the counter was about who was stealing whose signs. The day before, there had been a letter to the editor in the Defiance Crescent News complaining about sign theft. Everyone at the counter had a story about signs stolen in the night. One girl who had an Obama sign in her front yard complained of a neighbor who, seeing it, painted McCain-Palin in letters three times as large across his adjoining fence. Indeed, this swath of small towns and rural farms in western Ohio is at the eye of the storm in one of this year’s most hotly contested states. In 2004, while John Kerry was rolling up huge numbers in Cleveland, Toledo and other industrial cities, George Bush swept through rural Ohio rolling up 2-1 and 3-1 margins in the small towns, and building a 118,000 plurality that gave the Republicans Ohio, and ultimately the presidency. Kerry had largely ignored the western region of the state. Conservative social values on abortion, guns and gay marriage make it rough terrain for any Democrat. But the Obama campaign is not ceding any ground this year. They have opened 81 field offices in the state, according to their website, over 50 of them in small towns and rural communities. And this time around, they are moving in to stay. The Obama canvassing effort is called “Neighbor to Neighbor.” The local field directors are paid staff who have all gone through the Saul Alinsky school of community organizing they call “Obama Camp.” Their mission is not only to have an Obama presence in these communities, but to build a network of local volunteers who will stay on after the election to build the Democratic party. With its huge financial advantage and sophisticated Internet operation, the Obama campaign has trained thousands of new Democratic volunteers, organized them into teams with captains and foot soldiers, and given them an array of Internet tools to search out, find out and turn out Obama voters. In 2004, the Democratic approach to organizing was scattershot. While Kerry focused on delivering the campaign message in person and in his TV ads, his Get Out The Vote campaign was left to independent 527 committees like Americans Coming Together (ACT) and MoveOn.Org. In part, this was a way for Democrats to get around federal spending limits by assigning certain tasks to “uncoordinated” independent entities. In Ohio, ACT brought more than 200,000 new Democrats to the polls by pounding the streets, and MoveOn.org came up with a clever internet-based way for committed volunteers to download call lists and track responses from home. But there was no easy way to integrate their efforts or, like the Republicans, tie into consumer databases to find likely new voters. So when the election was over, the Ohio Democratic Party tried to remedy the problem by creating a software program called “Vote Builder” and used it in 2006 to help elect Gov. Ted Strickland and Sen. Sherrod Brown. Vote Builder provided a foundation, but it wasn’t long before the Internet team at Obama headquarters was souping it up with blogs, Facebook connections and other social networking twists. The blueprint for the Obama field organizing effort is laid out in a website called MyBarackObama.com (nickname: my.BO). It is a 2.0 version of “Vote Builder” that Obama’s technology gurus have been developing, by trial and error, throughout the primary process. From a user standpoint, it is the swiss watch of campaign organizing, elegant and easy to navigate. If you sign up and type in your zip code, you can find nearby campaign events, download lists of voters to call from home on your own time, get maps with the names of voters targeted as potential supporters, send out private fund-raising appeals, and create your own blog to share your personal experiences on the campaign trail or build team morale. After calling or canvassing, you then upload the results back to the website. The feedback is instanteous. Last week in Ohio, for instance, Chicago headquarters knows that volunteers knocked on 340,846 doors last weekend and made 394,335 phone calls. They have already sorted the names and addresses of voters who favor or lean toward Obama into an election day call list, flushed out the names of voters who don’t, and created a fresh contact list for next week. If a canvasser ran across an undecided voter, he might be added to the new list (with comments on his earlier concerns). So might new prospects culled from the consumer databases Obama gained access to when he shifted the Democratic party operations to Chicago last summer. These databases include thousands of mailing lists for car buyers, magazine subscribers, sports fans, Opera buffs, gun owners, etc. Using predictive models, the campaign searches out names and addresses of people “likely to vote Democratic” – Volvo buyers, New Yorker subscribers or Sierra Club contributors, for instance – for volunteers to visit. Still, the software is only half the story. “Neighbor to Neighbor” is where the Obama campaign puts a human face on the Internet operation. It does this by getting volunteers to share their own reasons for supporting Obama (and, of course, providing scripts of talking points if anyone comes up short.) Even after voter responses have been categorized and uploaded, volunteers are encouraged to discuss them in the field offices or share them in future training sessions. In addition to canvassing, the Obama office today is running a test of its Election Day drill. (The same drill was practiced at offices across the state last week.) On Election Day, volunteers are expected to come in at specific times of the day for specific tasks. In the morning, the task is calling lists of supporters who haven’t early voted. Around noon, poll sheets will be reviewed to check off who has. By late afternoon, supporters who haven’t voted will be tracked down and escorted to the polls. Defiance is not inherently friendly territory for Obama. In 2004, Bush beat Kerry there by 24 percentage points. But it’s a small universe of voters. Only 18,000 of the 27,000 registered voters in Defiance County went to the polls in 2004. 11,500 voted for Bush and 6,700 voted for Kerry. If 1,000 fewer Republicans show up this Tuesday and the Obama field office can gin up 3,000 more supporters, Obama might actually win Defiance County. 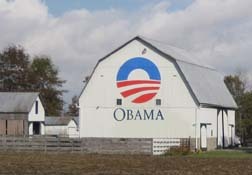 Her hope – the hope she painted on her barn – is that Obama can restore a more civil tone to American politics.